The ultimate playbook and scouting solution for coaches. A dynamic learning app makes your team better prepared on gameday. Just Play Solutions would like to take a moment to celebrate the success of some of our basketball clients. Here’s a handful of teams that caught our eye in 2017-18. Select your sport to learn more about Just Play. Build playbooks, diagrams, scouting reports and quizzes with easy-to-use coaching tools. Send information to players on apps designed for personalized learning. Access reports on player usage to keep players accountable and improve your preparation. Put everything you do in one place to avoid switching between tools to prepare for practice and games. Build interactive playbooks, gameplans, scouting reports, and quizzes. Prepare faster and be more organized than ever before. Easily import any type of file, including video from your existing breakdown tool, and attach it to your plays, gameplans, scouts, and quizzes. "Being able to teach our playbook visually is a game changer. This is a phenomenal coaching tool." "From our virtual clinic to teaching our team, Just Play is the best in the business." "Just Play improved our playbook and game planning in every way." "Just Play helps our staff teach our guys faster." "It is the single most important technology we use, the best teaching tool in the game." "Just Play has enhanced our preparation and made our video playbook possible." 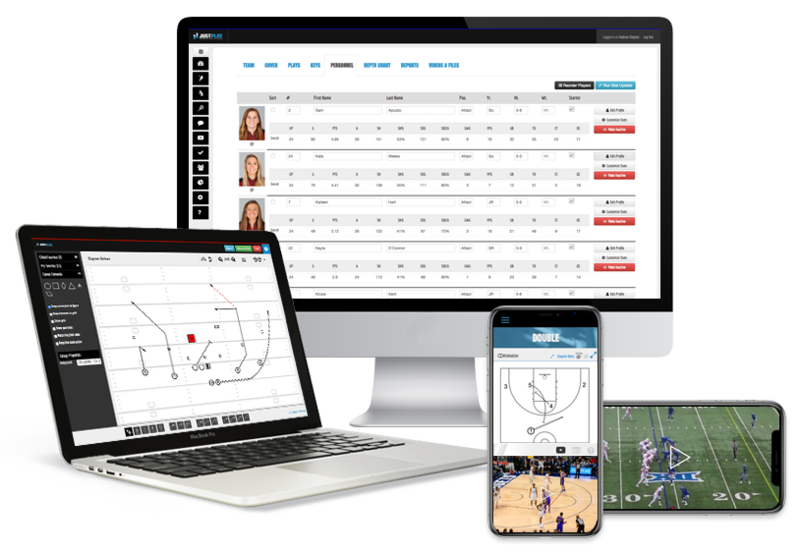 From our easy-to-use digital tools for building playbooks and diagramming plays, to providing automated statistics and in-depth analytics at the collegiate and professional levels, Just Play software products will help any coach improve his or her preparation. First, Just Play features the best content creation tools on the market. We make it easy for coaches to build their playbook, diagram plays, create gameplans and scouting reports, and incorporate video into their teaching. Next, coaches can instantly share this information with players on mobile apps. Athletes can study your content on any phone, tablet, or laptop. This provides a better way to engage with today’s youth who simply don’t learn on paper. Finally, all player activity can be analyzed to improve your teaching. Your preparation will improve from week to week as you digest how players study your playbook and scouting reports. This includes page view and time tracking as well as auto-graded quizzes. It all adds up to better a preparation process for coaches and players. More prepared players make fewer mistakes, and this leads to better performance on gameday.